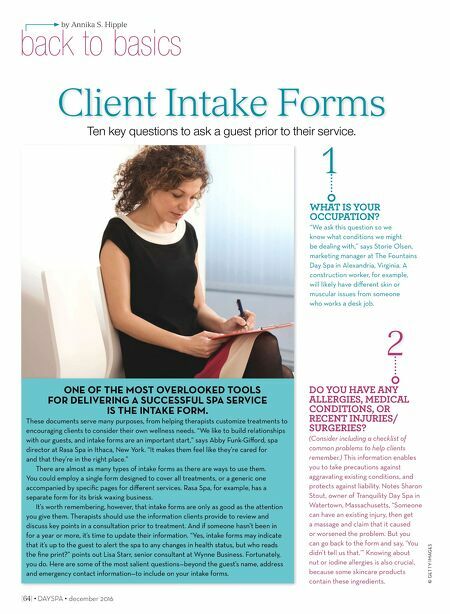 [ 64 ] • DAYSPA • december 2016 back to basics by Annika S. Hipple Client Intake Forms © GETTY IMAGES ONE OF THE MOST OVERLOOKED TOOLS FOR DELIVERING A SUCCESSFUL SPA SERVICE IS THE INTAKE FORM. 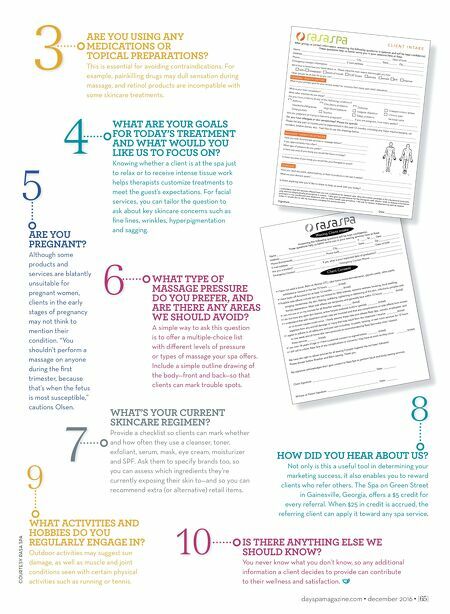 These documents serve many purposes, from helping therapists customize treatments to encouraging clients to consider their own wellness needs. "We like to build relationships with our guests, and intake forms are an important start," says Abby Funk-Giff ord, spa director at Rasa Spa in Ithaca, New York. "It makes them feel like they're cared for and that they're in the right place." There are almost as many types of intake forms as there are ways to use them. You could employ a single form designed to cover all treatments, or a generic one accompanied by specifi c pages for diff erent services. Rasa Spa, for example, has a separate form for its brisk waxing business. It's worth remembering, however, that intake forms are only as good as the attention you give them. Therapists should use the information clients provide to review and discuss key points in a consultation prior to treatment. And if someone hasn't been in for a year or more, it's time to update their information. "Yes, intake forms may indicate that it's up to the guest to alert the spa to any changes in health status, but who reads the fi ne print?" points out Lisa Starr, senior consultant at Wynne Business. Fortunately, you do. Here are some of the most salient questions—beyond the guest's name, address and emergency contact information—to include on your intake forms. Ten key questions to ask a guest prior to their service. 1 WHAT IS YOUR OCCUPATION? "We ask this question so we know what conditions we might be dealing with," says Storie Olsen, marketing manager at The Fountains Day Spa in Alexandria, Virginia. A construction worker, for example, will likely have diff erent skin or muscular issues from someone who works a desk job. 2 DO YOU HAVE ANY ALLERGIES, MEDICAL CONDITIONS, OR RECENT INJURIES/ SURGERIES? (Consider including a checklist of common problems to help clients remember.) This information enables you to take precautions against aggravating existing conditions, and protects against liability. Notes Sharon Stout, owner of Tranquility Day Spa in Watertown, Massachusetts, "Someone can have an existing injury, then get a massage and claim that it caused or worsened the problem. But you can go back to the form and say, 'You didn't tell us that.'" Knowing about nut or iodine allergies is also crucial, because some skincare products contain these ingredients.